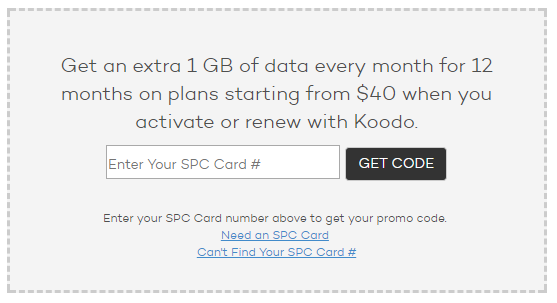 If you are a student with a SPC card and a Koodo mobile user, you can get an extra 1GB of data every month for 12 months on plans starting from $40 when you activate or renew with Koodo. Offers valid from 08/01/2017 until 07/31/2018 at participating locations in Canada only. Restrictions may apply, offers may vary. Usage may be restricted when used in conjunction with any other offer, clearance, in-store promotion or retailer loyalty card discount. Cannot be used towards the purchase of gift cards, or certificates. For card holder only; valid student ID may be required (except VIP).